Clean Shaven Apps is writing on the Svbtle network. Every Thursday, around noon time PST, Apple refreshes the App Store featuring a new set of apps. 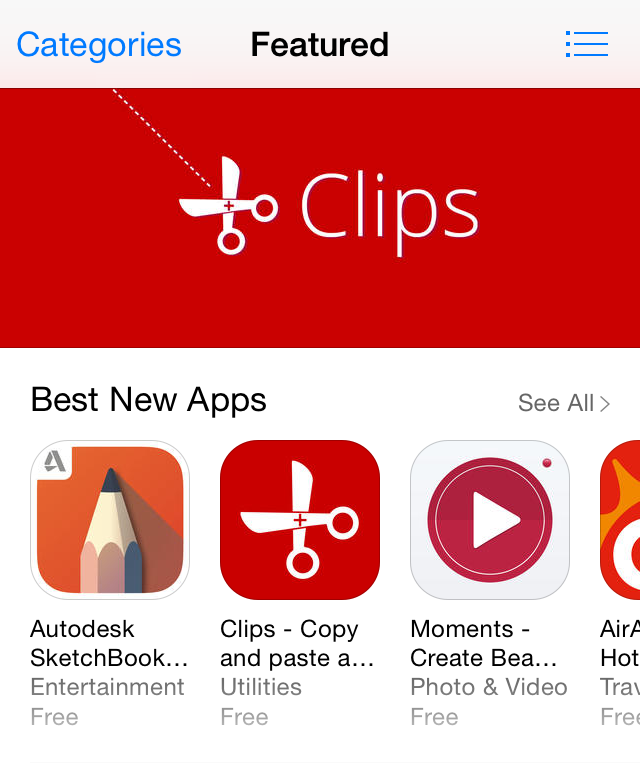 Clips was fortunate enough to be featured by Apple on a number of App Stores this week, coinciding with its launch. That, of course is the best thing that can happen to any developer. This doesn’t happen out of the blue though. You’ll get some heads-up that Apple is considering to feature your app. This comes in the form of a Promotional Artwork Request email, sent to all of your iTunes Connect Admin and Marketing accounts. Although we’ve never struck lottery before, we imagine the feeling is pretty much similar when you receive this email. It was late June, almost a month after Apple had unloaded a slew of iOS 8 APIs onto developers at WWDC. I was reading the Book of Matthew on my iPad while commuting on the train, and I came across a number of verses that I’d like to jot down for later reference. I started to think how different it’d have been on my Mac. The number of steps taken wouldn’t have been very different, but I knew it wouldn’t have felt as painful. After all, switching apps is fast on the Mac, and I’m a keyboard junkie. It has been a while since we updated Dispatch. We have been busy with some popular requests by our users and preparing fixes for some of the most annoying bugs in Dispatch. There are a variety of file storage services in the cloud, and we understand that everyone have their own preference. 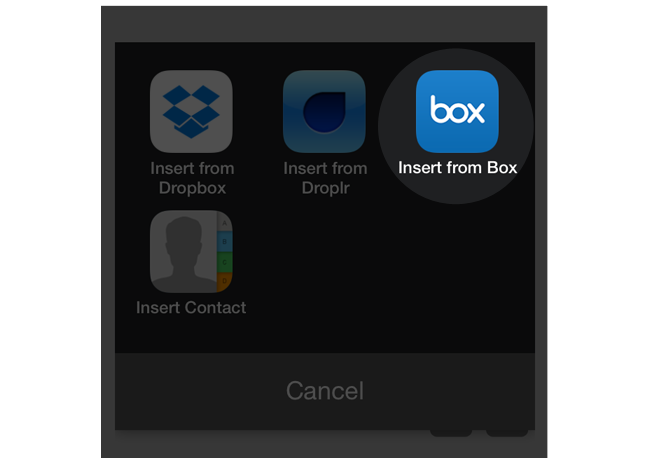 We released an update earlier with Dropbox & Droplr integration so that you can attach links while composing email. 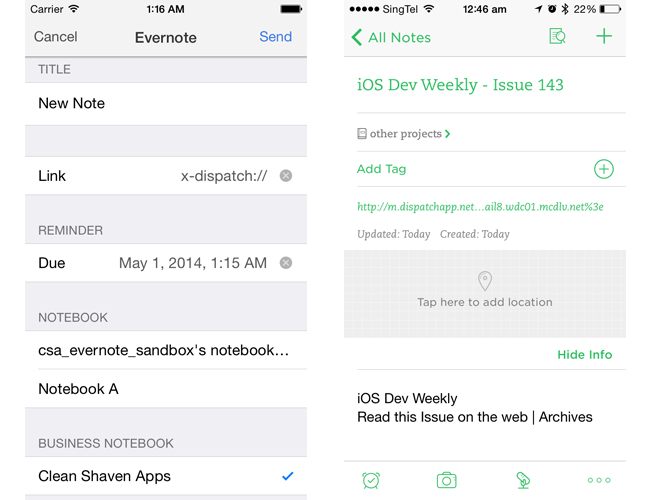 With this update, you can start attaching links from Box app. This update brings new Pinboard actions to bookmark links in emails with three 3rd party Pinboard apps - Pinbook, Pushpin & Pinner.